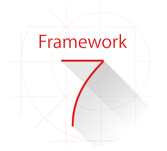 What is Framework7 tutorial about? Framework7 is an open source framework for mobile HTML and is used for developing hybrid mobile applications or web applications for iOS and Android devices. This tutorial will give a basic idea on Framework7 and on some detailed concepts. This tutorial is mainly prepared for beginners which will help them in understanding basic Framework7. After completing this tutorial, users will find themselves at a moderate level of expertise in Framework7 from where they can take themselves to the next levels.